Designed to be used by children ages 2 and up, the Pixi Pediatric CPAP mask is the best mask on the market for young children with sleep apnea. Created to be adjusted by parents or adult caregivers, the Pixi CPAP Mask offers extreme levels of comfort for young children, while not sacrificing on the performance of adult CPAP masks. Caregivers needs, as well as the comfort and safety of the child, were kept in mind during the construction of the Pixi Pediatric CPAP Mask. Created with safety in mind, this latch allows for an adult or care giver to quickly remove the mask during the night or during the course of an emergency without causing pain or discomfort on the child. Made with breathe-o-prene material, the headgear is light weight and unobtrusive, sitting out of the child's ears and eyes so there are no vision obstructions or discomfort while wearing the mask during CPAP therapy. 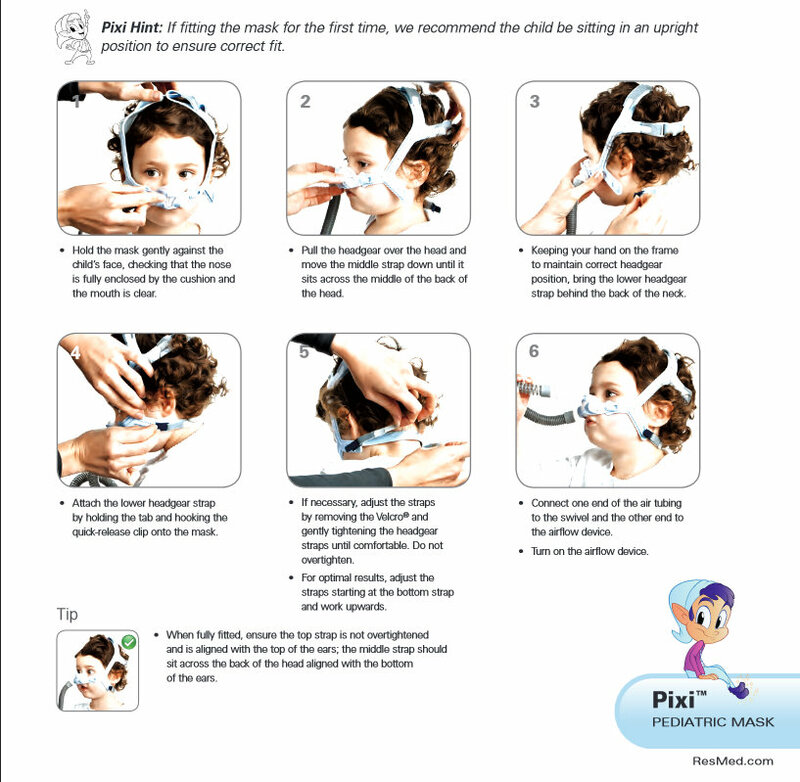 Pixi was designed with comfort in mind, which will help reduce the stress of convincing a child to wear a CPAP mask. As children tend to be frequent movers during sleep, mask drag is a common concern for adults and caregivers while the child is using their CPAP machine. The tube on the Pixi Pediatric CPAP mask can be attached to either side of cushion inside the mask allowing for adjustment depending on the sleeping position. The tube is also lightweight and flexible, allowing for stretching and bending during sleep which will result in less grabbing and a more comfortable night's sleep during CPAP therapy. The straps on the headgear are conveniently placed away from the vision of the child who is wearing it. While children are known to fidget and may try to tamper with the device, the strap locations should help reduce tampering. The straps also allow for the mask and headgear to be adjusted a multitude of times and in a multitude of ways so as your child grows you can quickly adjust the size providing the maximum amount of comfort. Gently place the mask upon the child's face, ensuring the nose and nasal area is fully covered from the cushion. Be sure the mouth is free and clear of all obstructions. Over the top of the head, gently pull the headgear until it is positioned with the middle strap across the middle of the back of the head. While grasping the mask frame, to keep headgear in-place, take the bottom headgear strap and bring it to the back of the neck. Holding the tab on the bottom headgear strap, clip the quick release into place on the mask. If needed, working from bottom to top on the headgear straps, slowly tighten or loosen the headgear straps until comfort is reached. Fit the mask tubing and swivel to the CPAP machine or appropriate device. How frequently should I be cleaning this mask? Just like the CPAP mask on an adult, the oils from the child's skin will build help and have negative effects on the cushion. You should wash the cushion daily with warm water and a mild detergent such as children's shampoo, and there are mask cleansing sprays and wipes available for purchase that are safe. If the cushion in the mask is uncomfortable after general wear and tear, or the seal has been effected, you can find cushion replacements available rather than having to purchase a brand new mask. I am having problems getting my young child to wear their CPAP mask at night, do you have any tip? As with any sort of training, encouragement and positive reinforcement is always helpful. Games and activities that the child can enjoy are a huge help, and rewarding them with stickers as you would see in a young child's class room is a great way to encourage them to wear their mask. Not giving up is the most important part. As your child grows, they will most likely recognize the positive effects on their health that their CPAP machine is giving them which will make the journey easier. My child has marks on their face after use, what should I do? It's likely that the mask is too tight. ResMed specifically designed the mask for children, rather than just taking an adult mask and scaling it to size. The mask was designed to rest comfortably on the child's face rather than tightly, so while you may think that tighter is better for the seal, in reality you are probably causing some discomfort to the patient and therefore should loosen the mask. If you can hear seal leaks while the child is wearing the mask, then the CPAP machine will recognize and make the necessary adjustments and compensate automatically. Over tightening the straps will not help with mask leaks.